Shipwreck discoveries since the 1980s have shed new light on Asian history. Shipwrecks are time capsules: in contrast to the layers of an archaeological site on land, we know that everything relates to a single moment.1 From the cargo, the ship, and the personal possessions of passengers and crew, we can learn about regional trade and seafaring. Often the evidence from a single site is limited: there may have been few durable objects; or the site has been extensively damaged by looting before archaeologists reach it; or there is no archaeological survey but individual artefacts come to light. As more and more shipwrecks are found, the evidence builds up like a photomosaic, in which all elements are valuable. The artefacts help us to date the shipwrecks, and the shipwrecks sometimes help us to date the artefacts. It is an intellectual jigsaw puzzle, in which details are often reassessed in the light of new evidence. The chronology section of this site is the part most frequently updated. Although rather dry for the general reader, it provides an overview of Asian maritime trade up to 1700, drawing on historical sources from many countries and new archaeological evidence. It is a repository of references and weblinks. At the foot of the chronology page is the growing bibliography. 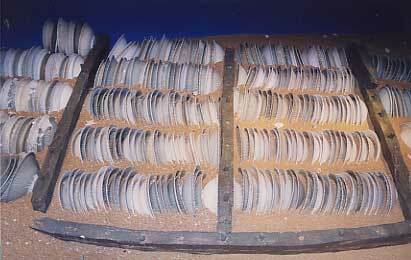 The 'Turiang' ship was a Chinese vessel, en route to Borneo and/or Sulawesi when wrecked in the 14th century. Her commercial cargo included ceramics from China, Vietnam and Thailand, plus iron ore and mackerel. The discovery provoked a reassessment of Thai ceramic history, and how it was influenced by the whims of successive Chinese emperors - as well as some reflection on the implications of an international trade in fish, presumably at the luxury end of the market. This wreck cast light on the political, economic and trade history of Asia. A detailed report on the 'Turiang' ship is available from the Malaysian Branch of the Royal Asiatic Society and on this website. 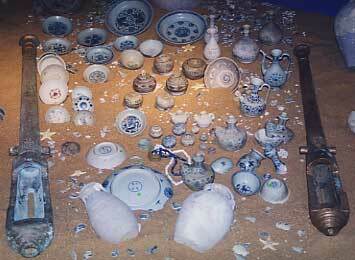 The Desaru ship, from China, sank in the 1840s, with a cargo of Chinese ceramics stored in built-in compartments which were well preserved. All essentials of the archaeological report are on this website. The Tanjung Simpang ship dates from the Northern Song dynasty (960-1126 AD), and could have greatly extended our knowledge of early Southeast Asian trade, but was heavily looted. All information we have is online. The 'Turiang' and Desaru ships were among the seven wrecks discussed in 'Discovering Asia's ceramic development'. 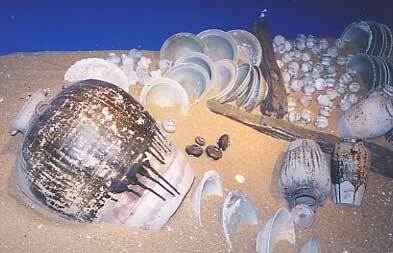 This formed part of the exhibition Maritime Archaeology Malaysia, shown at the national museum from 2001. Topic pages are supplementary to these principal sections of the site. 'Malaysia at the crossroads' explains the wealth of historic shipwrecks around the country. Some of the other shipwrecks, the 'Nanyang', 'Longquan', 'Royal Nanhai', 'Xuande' and 'Singtai' wrecks, are discussed in the web version of the exhibition and in the 'other wrecks' section of the Turiang report. The sister site Maritime Lanka is now hosted here, and can be accessed directly at www.maritimeasia.ws/maritimelanka/. There are exceptions: sometimes several ships founder in the same spot, some wrecks are in harbours where objects have been dropped overboard for centuries, and movements of seabed and currents jumble historic artefacts with other debris - but the general point stands: each shipwreck gives us a snapshot from a single moment in history. The late Dr Roxanna Brown considered all forms of evidence, took a constructive approach that ensured that she was widely welcomed and that evidence and theories were shared, and was constantly questioning her own hypotheses. Her exuberant enthusiasm for the ongoing puzzle is much missed. The replica ship is now on display in Singapore, but the original cargo, which Singapore also owns, is not: an absurd outcome of nihilistic academic politics which stymied the planned world tour. It might be ideal if all sites were perfectly excavated to the highest international standards, but underwater excavation is seriously expensive. The policies of wealthy countries where any 200-year artefact is precious may be unaffordable in those with longer histories and greater archaeological abundance. The option of preserving sites untouched is often unrealistic in the context of looting and seabed destruction. The Belitung site, discovered after initial looting, was excavated under government licence. This webmaster would prefer a pragmatic approach, with all evidence acknowledged, studied, documented and communicated to the full extent possible. Let us hope that the Tang Cargo and other remains of the ship will soon be back on public display - with 'Jewel of Muscat' alongside, in a museum that lives up to the wonder of the discovery.